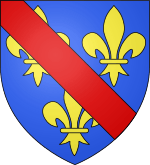 Coat of arms of the dukes of Bourbon from 1327-1410. Coat of arms of the dukes of Bourbon from 1410-1488. Coat of arms of the dukes of Bourbon from 1488-1523. Duke of Bourbon (French: Duc de Bourbon) is a title in the peerage of France. It was created in the first half of the 14th century for the eldest son of Robert of France, Count of Clermont and Beatrice of Burgundy, heiress of the lordship of Bourbon. 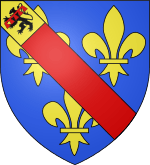 In 1416, with the death of John of Valois, the Dukes of Bourbon, were simultaneously Dukes of Auvergne. Although the senior line came to an end in 1527, the cadet branch of La Marche-Vendome would later succeed to the French throne as the Royal House of Bourbon, which would later spread out to other kingdoms and duchies in Europe. After this date, the title was given to several Princes of Condé and sons of the French Royal family. For most of their history, the dukes of Bourbon were closely allied to their royal Valois cousins. This allowed them to maintain their rank with comparable prestige. They fought against the English in the Hundred Years' War, and took the side of the Armagnac faction during the Armagnac–Burgundian Civil War. Peter II and his wife, Anne of France, daughter of Louis XI, had only one surviving child, Suzanne. They made her their heir through a concession from Louis XII of France. Anne, knowing that the Bourbon-Montpensier branch, the next senior branch of the Bourbon family, would pursue their claim, married her daughter to Charles, Count of Montpensier. Their marriage thus consolidated the vast possessions of the Bourbon family. The project, however, failed. Suzanne died childless, and the new king's mother, Louise of Savoy, claimed her inheritance, as heir by proximity of blood. Louise offered to marry the Duke of Bourbon to settle the matter amicably. But Louise of Savoy was already 45 years old, so the duke refused her, with insulting language. The king sided with his mother, driving the duke into a conspiracy with the Emperor and the King of England. Once discovered, he was stripped of his titles and possessions in 1523. With his death in 1527, the line of Bourbon-Montpensier became extinct in the male line. The next senior line, of Bourbon-Vendôme, were not allowed to inherit the forfeited lands. Therefore, the heir male of the Bourbon family belonged to the House of Bourbon-Vendôme from 1527 onwards, in the person of Charles de Bourbon, Duke of Vendôme until he died in 1537. Charles remained loyal to the king, even though Francis I had denied him the Bourbon inheritance and the inheritance of his wife, the sister of Charles IV, Duke of Alençon. Charles's son, Antoine, would become King of Navarre, and his grandson, Henry, would become King of France. All the present day family members descend from him. As the new reigning dynasty, the House of Bourbon-Vendôme was simply called the House of Bourbon. The title was vacant from 1523-1544. In 1523, Louise of Savoy, mother of King Francis I of France, challenged the succession to the estate of Suzanne, Duchess of Bourbon, who died childless. She claimed the succession as the heir by proximity of blood, as a descendant of the House of Bourbon through her mother. Seeing no hope of prevailing against the king's mother, the Constable of Bourbon went into the service of Charles V, Holy Roman Emperor. In 1531, the duchy merged into the royal domain for the first time. 1544 - 1545: Charles, Duke of Orleans, was the youngest son of Francis I of France. He died childless, and the title returned to the crown. 1566 - 1574: Henry, Duke of Anjou, a younger brother of Charles IX of France. He succeeded to the throne in 1574, and his titles merged into the crown. The title of Duke of Bourbon was granted in 1661 to Louis, Grand Condé. Most of his descendants preferred to use their ancient courtesy title, Prince of Condé; the title of Duke of Bourbon thereby became a courtesy title for some descendants of the Prince of Condé. 1756 – 1830: Louis Henri, Prince of Condé, son of preceding. At his death in 1830, the House of Condé became extinct. Marek, Miroslav. "Genealogy of the Dukes of Bourbon". Genealogy.EU.